It was alleged today that a city lawyer assaulted a fellow-ROH operagoer in a dispute over a woman’s coat. Westminster Magistrates’ Court was told that Matthew Feargrieve, 43, attacked Ulrich Engler, 56, during Siegfried at the Royal Opera House last October. The fight started after Engler grabbed a coat that belonged to Feargrieve’s wife from an empty seat and slung it on to her lap. The case has been sent to trial. It seems that Wagner brings out the worst in people. I remember my days in the ‘Stehplatz’ at Wiener Staatsoper, it was always scary but at its scariest during Wagner..
A sad comment on our times. 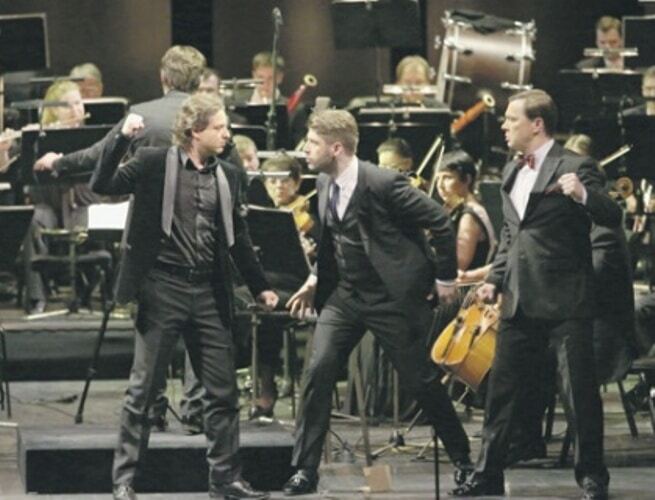 When I was a boy, the opera-goer fisticuffs were about the music. Without prejudice to this case which has still to come before the court…..I saw a full-on fist fight, at the front of the stalls between a load of Russians at ROH some years ago. Security never even came and threw them out. Some of the people at ROH these days are SHOCKINGLY awful. People just seem to feel like the only thing in the world that matters is their own will and ego, in that particular moment. There is just no sense of what my mother used to call “Couth”. Just another day at the Wagner Society. I’m surprised Mr Banker punched the other bloke over a coat? Usually Wagner acolytes resort to fisticuffs over whether Tannhauser belongs in the central canon of Der Meister’s output… or who should go to the electric chair first – Keith Warner, or Richard Jones? Don’t they have cloakrooms at the ROH? Word has it the coat had “Brexit” stitched. For once, Caravaggio, you actually said something funny. History shows that Wagner’s music makes men more aggressive. A Chelsea supporter commented from outside Stamford Bridge…. Another Winterstürme in a Teetasse which has a familiar Ring to it. Well, at least it didn’t involve a sword. Just a good warm up for slaying dragons. Must have been a damn nice coat.